It could be you next. Online People in Indonesia more than 90 million people. 96% of them use Google to find just about anything. Not using Yahoo, Bing, or other search engines. Interestingly, 90% of searchers on Google stop on the first page. The question: What about your business? Has it been on page 1 Google? Has it been seen, when there are potential customers looking for the product or service you offer? Or even your competitors? REMEMBER! The customer you're looking for, is looking for you - on Google. Your business should be the one found. Advertising on Google is a quick solution and can be one of your marketing strategy choices. Unfortunately, we all know, playing with AdWords is not easy. Like playing chess. Google AdWords is easy to learn, but hard to master. Many important components that the setting is overlooked by the layman. Introduce, Intl.Triafa.com, blog information and full time internet marketer. At Triafa.com, We offer a professional, reliable, and cost-effective Google AdWords ad install & manage service. With the team, We will help you meet with potential customers. The final goal is to bring profit, and accelerate business growth. We are also an entrepreneur like you. Over 3 years of playing with search engines. Currently We have 2 businesses that 90% of its customers come from search engines. We rely on Google AdWords to capture new customers. We already feel the benefits of Google AdWords advertising. We recommend your business using Google Adwords. Yes, let your business more skyrocketed. Why must AdWords Intl.Triafa.com service? You may be wondering, or confused in determining the best Google AdWords Agency. We understand, because many Google advertising service providers. This reason may be your consideration. We focus & keep learning the development of search engine marketing, 3 years is not a fast time, right? Keeping our reputation and trust for us is everything. That is why & why we remain. Google believes in Us, you can. The Google Intl.Triafa.com Advertising Services Client from SMBs to Corporate, with daily budgets varying from USD 30 - USD 300 per month. You can adjust to the size of your business. You can start from the budget of USD 30 - USD 300 per month. At Intl.Triafa.com Minimal Budget is USD 30 per month. Whatever your budget will We manage with professionals. Google AdWords is an online advertising of Google products that are the market leaders in PPC (Pay Per Click) based advertising, or often called CPC (Pay Per Click). With Google AdWords you can create ads that appear on Google search engine pages and across the millions of websites that go into the Google network. Google AdWords is full of powerful features, and highly customizable for your business. Triafa.com has experience in creating and managing Google AdWords ads to be effective, on target, at the lowest cost possible. Full Control - Google AdWords grants you full power in your advertising settings - like when it appears, the ad content, and how much you pay for each click. Google AdWords is both sophisticated and flexible, so you can optimize your ads for maximum performance for your business. Triafa.com can help you achieve the best results. Broad reach - the term "Googling aja" is enough to describe if Google is the most favorite search engine in Indonesia, also the world. 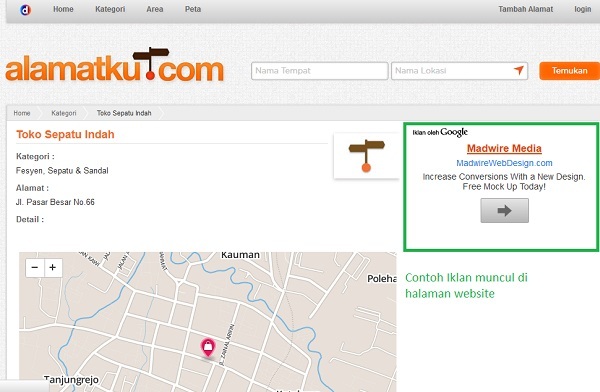 The Google site also ranked first the most frequently accessed websites in Indonesia. Google AdWords ads are ready to appear in front of millions of netizens, with a very wide reach. Effective - You only pay when there are internet users who click your ads. Relevant - Google AdWords appears before internet users looking for the product or service you offer. Notabene they are prospective customers who are ready to buy and very likely to happen repeat orders. Incorrect settings will keep running Google AdWords Ads from spending more than they should. It could bring in a lot of traffic but with less results, consequently wasted budget wasted. Our responsibility as a Google AdWords provider is to make sure you have the best advertising campaigns. Here's what we do. Research, analysis to find the best keywords to target according to your business. The analysis includes the business involved, the products or services offered, unique offers, target markets, landing pages, and competitors. Specifies the keywords that are "forbidden". If you only sell 'new car tires', we will get rid of the keyword "used car tires," so as not to waste irrelevant fees or clicks. Write an ad copy to 'attract' internet users to click and visit your website page. Set up campaigns based on research and analysis. Where does your ad appear? By default, your ads will appear on Google search results pages (either for PCs, laptops, tablets, or smartphones). If you want your ads to also appear on web pages that fall within the Google network (Google Display Network), we will help you with different terms and conditions. Your ads appear on Google search results pages. Advertising messages are very effective in capturing potential customers because they appear to the right people, at the right time, when they are looking for the product or service you offer. Google AdWords ads can also appear on the millions of web pages that are included in the Google network. Similar to SEM, you can capture potential customers because your ads can appear on web pages that have the same theme you offer. Let's use our Google Ads Service! The choice is right from the start. Triafa Corp is an organization that aims to provide a variety of interesting and updated information. Geo Wasi Xyz www.geowasi.xyz Geo Wasi Xyz Is A Travel Affiliate Marketer Blog (Plane Tickets, Hotel Vouchers, Bus Tickets, Tour Packages, Etc.). Placing Ad intl.triafa.com Post a cheap ad on Intl.Triafa.com from USD 3,1, advertise now!